Caldera’s intuitive production suite for textiles gives design, color, ink and substrate control at the touch of a button, allowing textile producers to create patterns and variations without error and waste. TextilePRO features standard-ready color management and supports all major textile printer manufacturers. Caldera’s intuitive production suite for textiles gives design, color, ink and substrate control at the touch of a button, allowing textile producers to create patterns and variations without error and waste. 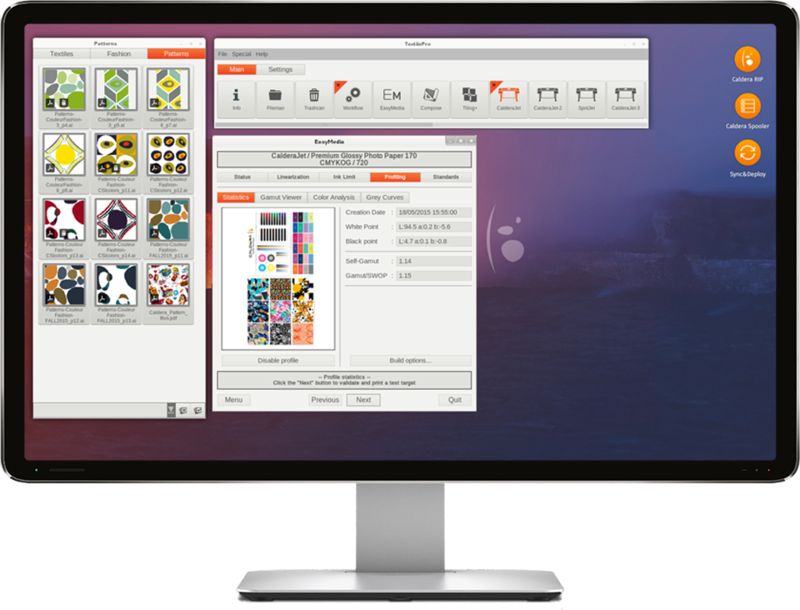 TextilePRO features standard-ready color management and supports all major textile printer manufacturers. TextilePro keeps all colors in RGB to guarantee full fidelity to the original. Fashion users can take advantage of a choice of generation methods for blacks to achieve the richness and texture they desire for their design. CustomInkset option allows you to add a new color mode to NColor Printers. Creating repeatable, aligned patterns is child’s play with TextilePro, thanks to the inclusion of Caldera’s existing Tex&Repeat module which works in tandem with the Photoshop plug-in for colorizing patterns and swapping swatches quickly. Your colors need to be accurate and repeatable. TextilePro will ensure that the colors produced match those your designer specifies and are consistent across the full production cycle.